This foliage accent is a succulent perennial belonging to the Agave family. 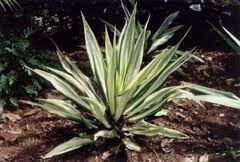 It is made up of rosettes of sword shaped leaves with lemon, cream and lime green striped. Garden designers call it an 'architectural' plant, as it has stand out sculptural foliage. 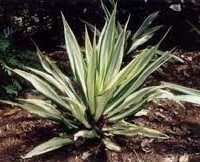 It makes a hardy and spectacular pot plant with lively foliage and a interesting colored leaf margin.